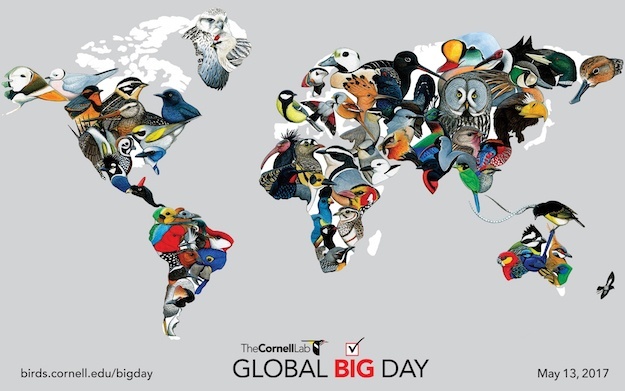 This spring, the Cornell Lab’s Team Sapsucker is going global with our annual “Big Day” conservation fundraiser—and inviting you to come along. The goals are ambitious: with your help, we hope to tally 4,000 bird species in a single day and to raise $500,000 for conservation. You can join in by spending a few minutes birding on May 13 and entering your sightings at eBird.org. To get ready for this global event, download this magnificent world map for your computer desktop background and help us count down the days to Global Big Day on May 13, 2017.
Credit: Global Big Day map painted by Luke Seitz, a Bartels Science Illustration intern and member of the Redheads student birding team.